Are you troubled with a leaky basement? Foundation Specialties has your solution! We have several effective and reliable ways to solve wet basement problems utilizing the complete line of Basement Systems waterproofing systems. To schedule a free basement drain installation quote, contact us by phone or e-mail today! We provide free on-site cost quotes to homeowners throughout our Arkansas service area, including Lowell, Fayetteville, Springdale, surrounding areas such as Harrison, Mountain Home, Bentonville, Van Buren, Bella Vista, Alma, Siloam Springs, and nearby. The Basement Systems WaterGuard® system is a piping system engineered specifically to solve basement water problems effectively without worry of clogging from soils under the floor. The WaterGuard® system is applicable to all types of foundations including block, poured concrete, stone, etc. Weep holes are drilled into block walls to drain water out of the walls into the system. 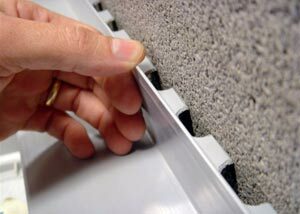 Water enters the WaterGuard® system via holes on the wall side and flows in the WaterGuard® conduit to a SuperSump® or other drain. The WaterGuard® system intercepts water at the perimeter of your basement and drains it unseen safely away. This system will keep your basement clean and dry so you can use the space for storage, recreational purposes, or to finish for additional living space. Most interior Basement Waterproofing Systems rely on a sump pump as the final mechanism to get water out of the basement. 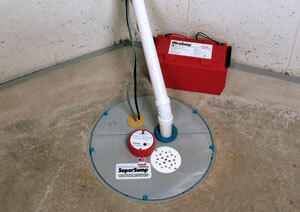 The sump pump is the heart of the system. 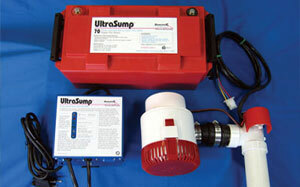 The SuperSump® includes the finest pump available- a high end 1/3 hp cast iron pump with a mechanical float switch. It pumps 2650 gallons per hour smoothly and quietly. It resists clogging and can pump up to 1/2" solids. It will perform reliably for many years. The reliable UltraSump® back-up pump is designed and manufactured by Basement Systems Inc. specifically for Basement Systems product applications. Should your primary pump fail because of a power outage or any other reason the water rises and automatically turns on your UltraSump® back up system, which is powered by a battery specifically designed for long term stand by use. When power is restored the battery is automatically recharged for the next emergency. The high-tech charging system was engineered for this purpose and adjusts the maintenance charge current based on the condition of the battery. You can rest easy 24 hours a day knowing the UltraSump® is on the job, especially when you are away from home.